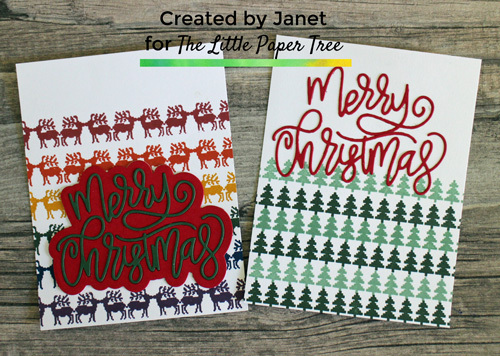 Hello, Janet here with some more Christmas card inspiration using the Home For The Holidays collection and the fabulous Catherine Pooler inks. All the products I used to make these cards are listed at the bottom of this post and linked to the shop. I used Catherine Pooler Premium white card for both cards – we keep a bunch pre-cut to A2 sized for easy crafting. Both cards were quick and easy to make and use minimal supplies. I only used one die set and one stamp set from the latest Stamp Of Approval box. I also mixed the Party inks with the Spa inks to get my festive colours. For quicker stamping I place the border stamps in my Stamp Platform so I only needed to move the card. The reindeers were stamped with Royal Treatment, Juniper Mist, Spruce, Sauna, Mandarin Spice and Peppermint Scrub. For the trees I alternated Spruce and Mint To Be. I diecut the Merry Christmas die from red card twice and green card once. On the reindeer card I adhered the complete die in red – keeping the words in the die and added the green “Merry Christmas” over the red to help it pop up. And just used one layer of the Merry Christmas for the Christmas tree card. And that’s it. I adhered both panels to an A2 card base and these two quick and simple Christmas Cards are ready.